Give me 2 minutes and I can show you how you can too! My name is Laura Roman Lopez. I’ve spent the past fifteen years of my life in the field of personal development. I’ve helped people just like you set a plan for success and then follow it through. I not only mentor wealth creation techniques, success principles and manifesting Universal Laws, I am living proof that they work. Once you know how these same principles helped me to overcome extreme adversity, you “will believe”. This belief will be big enough for you to think that success can, in fact, happen for you as well. Stop struggling through life, stop feeling like a failure and believing there is no way out. Finally discovered, as a senior in college, that I had a severe learning disability that went undetected throughout my entire academic career. At the age of twenty-two, two weeks after graduating from college, I was diagnosed with Multiple Sclerosis. In 2005, I was diagnosed with cervical cancer and had a very painful and emotionally scarring life-saving operation. The principles that I share with you in the “Mastering Wealth System” are the exact same principles that I used to overcome all of these life altering challenges. My mission is to empower you with the same strategies that will work to overcome any adversity and guarantee that in taking self responsibility, only YOU have the power to attract real success and wealth that is so rightly deserved. Success lies only within you! Just think how much easier and happier your life would be if you mastered wealth creation and success principles, and if you controlled your destiny rather than letting it control you. I’ve taught people how to manifest success! I’ve given people just like you the tools to reach their potential. Let me tell you something. The fact is that more and more people each day are taking control of their lives and generating wealth like you wouldn’t believe! What’s more, they’re experiencing what you dream of happening in your own life. I have to tell you that it’s not because they’re lucky, more educated, or smarter than you. They just learned how to do it. You can too. It doesn’t matter who you are. There is nothing stopping you from obtaining the things in life that you want. There’s nothing barring you from success. Listen. I’m willing to bet that at some point in your life you have taken a personal success seminar, or bought self improvement books. And I’m also willing to bet that even if you studied the material presented, it didn’t take you where you wanted to go. It didn’t teach you to be as successful as you still want to be. In fact, if you’re like a lot of people, you come away from seminars and books feeling excited and motivated – but that’s it. You know the feeling I’m talking about. Adrenaline is pumping through your veins, and you feel extremely empowered! But did you ever notice that feeling never lasts for very long? After a seminar or the last page of the book, the feeling wears off. Once you get back to your world or start the grind again, the excitement wears off, you’re left with a glimpse of what could be. It’s simple. When we’re talking about success, we’re not talking about one peak moment or event in your life. That’s not success. That’s just a teaspoon-sized taste of it. Success is a learned mindset. True success is a consciousness. True success is having what you want, where you want it and for however long you want it. And you have what it takes to manifest success NOW! Specializing in Learning Disabilities With a 4.0 G.P.A. I think I gave up on ever being successful in my life before I came across your site. Just a brief bit about me. I have a high school education, and although I was blessed with intelligence and a decent job, I only managed to make ends meet. I never thought I’d be able to run my own business or even make tons of money – not without going back to school. Then I found you, and I stopped thinking that I couldn’t do it. I started thinking that I COULD and planning for it. Right now, I’m still working at my job, but I’ve started my own business on the side, I have a hefty savings account, and I just feel better about myself than I ever have before. You were right. The better I feel about myself or the more positive I think about myself, the more I succeed. Thanks for teaching me! I plan on quitting my job in the next year and just running my own company full time. Thanks again. My finances weren’t in bad shape when I found you, and I had an excellent job. The only problem was I worked way too much and kept a high stress level. I wanted to have more time at home, and honestly I wished I didn’t have to work at all, even though I know that wasn’t possible. When I heard what you had to say, I was very doubtful it would work. There are so many online things that say they work, but don’t. However, you said something that struck a chord with me. You said that success starts in my mind, and that I was thinking the wrong way. That’s what made me decide to try because I know that negative thoughts can do harm in your life. Well… I started my own business a few months ago using the info you gave me. I would have never thought I could do that before. (See!) The money I make from that allowed me to quit working insane hours in the workplace and have more time at home. I’m looking forward to even more great things happening. I have goals and one of those is to be able to retire in five years. I’m 51. I wouldn’t have been able to do that before you. Now I will be able to and not have to worry about money. My business keeps doing better and better! The wealthy aren’t lucky, they have mastered the success principles found in the Mastering Wealth System. In my fifteen years in personal development, I’ve been fortunate to work with some of the top success coaches and gurus. I’ve seen firsthand that the most successful people in this world are made of the same fabric as you and I. Those who have conviction, persistence, determination, strategy, systems, strong moral fiber and a belief in Universal manifesting energy will achieve success – not just once, but constantly. Every day! How to get to know yourself and your ambitions in life. Why you and only you can control your success, income, and life. You’re going to realize exactly why success is within you, and not a result of outside factors. Why (and how) your subconscious can negatively effect your success. Before I can tell you how to have the right mindset for success, you have to be able to recognize the wrong mindset. I’ll teach you. How your conscious mind can effect your success positively. How to rewrite your reality. I know this sounds crazy, but just doing this changed my life for the better. How I viewed myself was damaging my success! How to become more aware of your mind power can change your energy to work in your favor! How to be the type of person that attracts success. Success might be a goal, but it’s the kind of person you are and the steps you must take to get to it. How to recognize and eliminate damaging self talk. Quiet the thoughts in your mind that create turmoil, stress, doubts, etc. How to give to others in pursuit of success. It is no secret that you become successful by helping others to become successful. Learn relaxation and mind manifiesting techniques. I’ll teach you how to meditate, use visualization and affirmations effectively. How to become successful in the midst of adversity, and how to turn it into a gift. Exercises that you can do to improve your mind power. I’ve included exercises at the end of each chapter. These are the same exercises I used, and you will have the same success! Whether we know it or not, our energies are focused and those energies are working in our lives, for better or worse. Like electricity, our own energies do not decide they will work in one area, and not another. When you understand that your mind’s energy will draw to it, like a magnet, anything that you see –subconsciously or consciously, you then have the power to change your reality and abundance of any kind. But changing the way we’re wired isn’t as easy as wishing it into being. It takes reprogramming to get your “wires” straight and to get you focused on success. 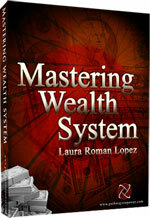 Using the Mastering Wealth System, all the secrets I’ve talked about are going to be yours to learn, then utilize. Together, you and I are going to create and implement a plan for your success. I’ll help you examine your thought process and your beliefs, show you what thoughts are good and which ones are bad, and teach you how to plan for success in just three easy steps! Best of all, it works and it’s going to work for you. Hey, you and I both know that nobody can guarantee your success. Only you have the power to do that. I guarantee you that the Mastering Wealth System is going to teach you exactly how to take control of your success and be as successful as you want to be, but you have to make it work for you! Just tell me this. What do you want? To Be In Control of Your Life? Create Massive Momentum for Success? A Life where Abundance is the norm? The Mastering Wealth System will help you achieve all this…and all the success that you want in your life! It’s amazing what the mind can accomplish once you set it on the right track! I wanted to answer your question from your last email. I started my own business after reading "Mind Factor." I think starting your own business is what everyone wants to do. Everyone just doubts they can do it successfully. But that’s what you’re for. But yes, to answer your question – I did start my website and it’s doing very well. It’s gotten big faster than I expected, but that’s fine by me. You know, my friends think I lucked out and had some goldmine of an idea. It wasn’t that at all. I learned to plan for success because of you, and to think for success. There’s no luck about that. Just a incredible person who teaches people to make their dreams come true. Bless you. Thank you for "Mind Factor." I think I’m the person you wrote about on your website because I had spent so much time and money on personal development seminars and improvement seminars. None worked because I was left saying, "okay, now what?" I worried I would feel that way with you, but I never did. It’s like you started with the first thought in my mind and just built the foundation for success – inside me. Then with the knowledge you shared about starting my own business and creating wealth – well, I am truly successful for the first time in my life. I may not be rich. Yet. But I’m stress-free and money worries don’t trouble me anymore. I don’t have any! Let me tell you, “Fundamental Factor” is pure magic! Changing the way you think now is the first step to success, but learning to build a solid foundation of wealth and the fundamentals of success are just as crucial! In the fascinating pages of this book, I’m going to reveal to you how to unlock your wealth potential, bring wealth to you, and every detail you’re going to need to know in your pursuit of success and money. The five key factors to obtaining wealth. Do you have them? You’ll have the correct mindset. After reading this you’ll have the keys to open up your door to wealth. I’ll tell you how to create wealth easily. Once you have the right mindset, it becomes so simple that you won’t believe it! Why success is a process and how to create a system to guarantee your success! What things are essential to your success. How to achieve your goals How to achieve your goals — and them some! We’ll even discuss what to avoid and inevitable mistakes that you might make on your way to success! But don’t worry! I’m here to teach you how to succeed, not fail. So every step of the way I’m going to teach you to plan for success and how to avoid failure! Close To a Million Dollars. Mastering wealth and success doesn’t happen simply because you wish it into being! It takes developing systems, creating and implementing strategies and even the littlest aspects of your life. But the good news is planning for success, managing your life, and actually becoming successful are not as hard as you think! “Success Factor - Success Strategies” is your roadmap to success. I’ll help you uncover the keys to your success, then teach you how to be as successful as you want to be. Listen. This isn’t just a quick how-to guide that leaves you wondering what to do next. No. I’m going to walk through your life and build your success with you… step by step. How to tap into your potential and demand more. Put it all into action! You just have to learn how to do it, you already have what it takes. How to deal with the fear of failure. How to create a realistic plan for success that will work for you! Everyone’s plan is different. You’ll learn to create yours. How to monitor your goals regularly so you achieve them. How to turn adversity into the most amazing opportunities. Time and business management. Time management is crucial to success. When you learn to manage your time, you then have the time to accomplish your goals and achieve success! to Help Skyrocket Your Success Into the Stratosphere! These seven reports retail for $14.95 individually. But for those of you that are ready for success, you are dedicated to realizing your potential, to becoming a manifesting machine, to be unstoppable - I want you to have them. For free. A Positive Attitude: The Multi-Millionaire’s Secret to Abundance. Identifying Your Barriers to Success: A Self Awareness Questionnaire. Ten Power Steps to Taking Control of Your Life. 5 Minute Miracle: Empowering Stress Management Tips. An Outstanding Life is Yours for the Taking. Goal Setting Techniques: A Guide to Effortless Accomplishment. Relax! A Seven Day Course to Higher Consciousness. Yes, Laura, I want success in my life! and participate in these exercises. I insist on wealth and success, I attract it and manifest it on a daily basis all because of these simple but little known secrets of the rich and wealthy that absolutely anyone can learn. The Mastering Wealth System works to help bring you the kind of success that you want. I know because I used it in my life to start my own business, make more than enough money, and live the happy life I dreamed of for my children and myself. Since I know it works, and I know it will work for you, I’m going to give you the Mastering Wealth System for just $97.00 with an iron clad guarantee just in case you’re still a little skeptical. In fact, skeptical is okay, but I want you to be successful. That said, I guarantee that if Mastering Wealth System doesn’t help you achieve more success in the next 365 days, I will refund your money. All of it. I won’t keep one cent. No questions asked. If you don’t achieve the success that you want after using the Mastering Wealth System, then I don’t deserve to keep your money! Think about it. Your success is totally risk free. I’m virtually putting a blank check for your success right into your hands. You decide how high the number is on it. However, if after one full year of using the Mastering Wealth System you haven’t been able to fill that check out at all, then I’ll give you your money back. Here’s to your sure-fire success! P.S. Since the Mastering Wealth System is priced at an extremely low $97.00, I can’t guarantee that it will stay at that price for long, or come with so many amazing bonuses. It’s first come, first serve for success! Don’t take the chance and be too far back in line to grab yours! P.P.S. 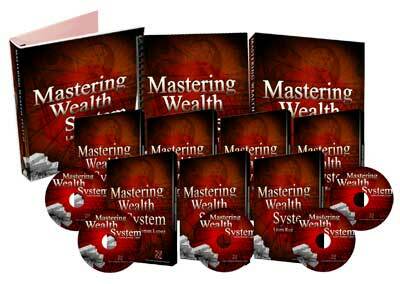 Once you download the Mastering Wealth System, you’re well on your way to success because it really works! You have a whole year to make it work for you. Get in the proper mindset right now and take advantage of guaranteed success!